Ohio State wages war on diabetes. One in 10 Americans has diabetes, and another one in three people are well on their way to getting it. Diabetes happens when the body either can't produce enough insulin or can't use insulin efficiently to process food for energy. As a result, there's too much sugar in the blood. Diabetes also contributes to other major health problems: heart disease, kidney disease, nerve damage and eye disease. 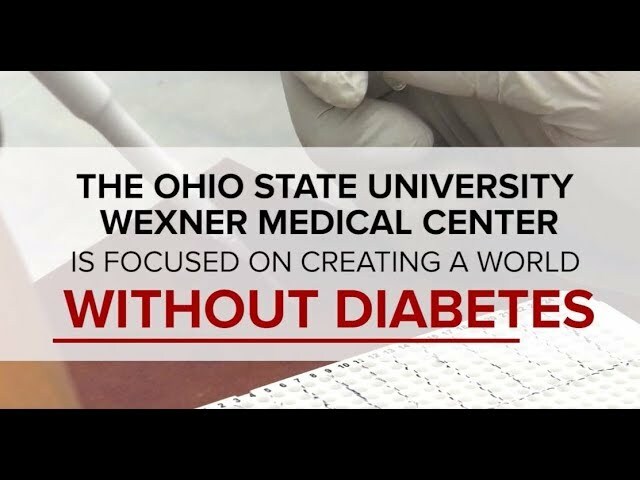 That's why diabetes is a high priority at The Ohio State University Wexner Medical Center. Our diabetes and endocrinology experts are nationally recognized for delivering the highest quality of care. We have sub-specialists who focus on type 1 and type 2 diabetes. With a personalized approach, our doctors, nurses, dietitians and certified diabetes educators team up with individuals to find the right lifestyle changes, medications and tools to effectively manage the disease and its symptoms, avoid complications and achieve each person's wellness goals. Ohio State's Diabetes and Metabolism Research Center is focused on creating a world without diabetes. So we're diving into the disease itself. We're learning, on a molecular level, why and how diabetes affects us, and we're finding new ways to treat and prevent it. One of our trials is looking at how cells communicate to cause inflammation and insulin resistance during weight gain. This can help scientists better understand the process that happens in type 2 diabetes, so someday they could stop the inflammation from developing. Another trial is testing stem cell treatment for people with type 1 diabetes. If this experimental treatment works, it could mean some patients could go from several injections per day to potentially none. We're one of only five hospitals in the U.S. and Canada enrolling people for this trial. Just recently, Kristin Stanford, an assistant professor of physiology and cell biology with the Diabetes and Metabolism Research Center, led a study looking at the effects of exercise on metabolism at the cellular level. Her group learned a specific signaling lipid, or lipokine, increases right after exercise, and it comes from brown fat. Unlike ordinary white fat that expands when we gain weight, brown fat can generate heat. Babies have a lot of it to help them stay warm, and adults retain a certain amount in their bodies. "This study shows that brown fat and this lipid, in particular, play an important role in the beneficial effects of exercise on our metabolism," Stanford says. "The brown fat tells the muscles to take up more fatty acids for fuel. This highlights a new role for brown fat in response to exercise." Next, Stanford wants to determine the mechanism by which this lipokine works. One day, she hopes this work could lead to developing new medications to lower blood lipid levels and burn more energy to help treat obesity and type 2 diabetes. These are just a few of the many examples of Ohio State diabetes and endocrinology experts at the forefront. Through relationships with partnering facilities, they're reaching patients in the far corners of Ohio, helping them take charge, manage their disease and improve their quality of life with the latest discoveries.